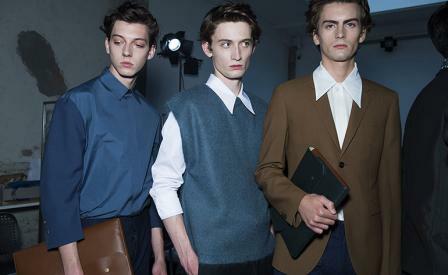 Mood board: Marni finally took its menswear collection off a static presentation and onto the backs of breathing real boys - but they were far from hot-blooded macho men. The Marni man is an intellectual creature, one who is much happier in an art studio or design gallery than an investment bank. So no suits here: but plenty of billowing Bermudas, sporty judo pants and shrunken jackets. Best in show: It seems banal but Marni's knit take on the t-shirt in painterly vertical stripes was an excellent example of the emboldened basics this brand excels at. Finishing touches: The jazziest part of the show happened from the ankle down where models wore tweed socks paired with tribal patterned intarsia flat form sandals - a quirky touch that added just the right punch to nearly every look.